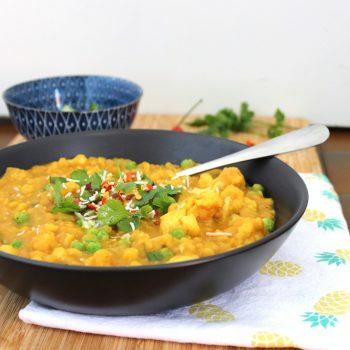 This curry recipe makes for a really delicious and satisfying meal, and is a great way to incorporate more veggies and legumes into your diet. As we talked about in our October Newsletter article, one of the best ways to increase the health of your digestive tract and microbiome is to consume more varieties of plant foods on a regular basis. Many of us get into the habit of eating the same foods each week – Whether that’s apples and oranges as your ‘go-to’ fruit, carrots and peas as your staple veg, or Basmati as your favourite rice, it’s easy to get stuck in the routine of eating the same foods week in, week out. This recipe is a great way to increase dietary diversity, as it uses yellow split peas, a bunch of different veg, and a few spices to boot. You can also serve it with different varieties or colours of rice, such as red rice, black rice or wild rice, along with a rainbow side salad, to really get your microbiome buzzing! Enjoy! Soak the split peas for 4-6 hours, then drain and rinse. Warm the sesame oil in a large saucepan. Add the onion and cook for 1-2 minutes over a medium heat, until it starts to soften. Stir in the grated ginger, turmeric, curry powder and curry paste, and cook for 1-2 minutes. Add the sweet potato, potato, veggie stock, water and split peas. Bring to a boil and cook uncovered for 30-40 minutes over a low-to-medium heat, until the split peas are cooked through (this will largely depend on how long you’ve soaked the split peas before starting). Make sure to stir occasionally, especially as the curry begins to thicken as the split peas are known to stick! You may want to add 100-250ml extra water throughout the process, if needed (be careful not too add too much, as you don’t want to end up with soup). Stir through the cauliflower florets, garlic and the spring onion, and cook for a further 5 minutes. Add the frozen peas and cook for 3-4 minutes, until the peas and cauliflower are cooked through. Just before serving, stir through half the chopped coriander, and sprinkle the rest on top (along with a dollop of coconut cream if desired). I like to serve this with black or red rice (just to mix things up) and a big side of veggies (usually lettuce, avocado, carrots and fresh capsicum, or in cooler months, steamed greens).